Since last month at DevCon, the team has been making steady progress on our ambitious goals for the coming year. 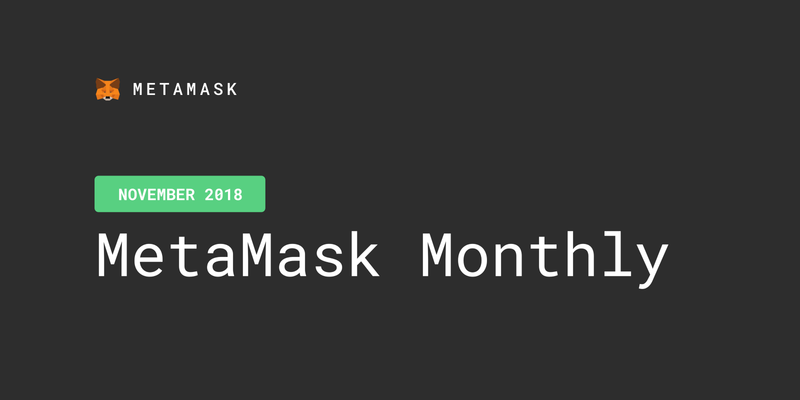 This newsletter has some updates on projects past and future, as well as several exciting shoutouts across the MetaMask family! Last month we launched a feature called Privacy Mode in MetaMask v5.0.0, which requires that dapps ask users’ permission to view their public Ethereum address. Over the past couple weeks, we’ve seen hundreds of applications across the ecosystem update to support this crucial privacy layer. We’re proud of the ecosystem for stepping up to protect user privacy and excited to keep working to improve the decentralized web. Last week a popular Bitcoin wallet was hacked, which has concerning ramifications for all cryptocurrency wallet developers and users. For a full description of the hack, you can read this blog post. Like all software projects, MetaMask has many dependencies in the open source world that help us bring you the ever-evolving experience you’ve grown to expect. In addition to continuing along our roadmap, MetaMask is spending some time improving security around our key management. We’ll first lock down the dependencies related to your keys. We’re also exploring the possibility of sandboxing sensitive portions of code to add the absolute highest certainty that keys are only accessed in the intended ways. Of course, if you’re taking advantage of our Trezor and Ledger hardware wallet support, you’d be immune to this kind of attack, provided you carefully review proposed transactions on the screen of your hardware device. MetaMask is stoked to announce our design team has grown by two! We’re welcoming Omna Toshniwal and Juwon Bahn to the team. Omna will focus on UX Research and Juwon joins as our second product designer. Design and usability are core to MetaMask’s mission, and our product serves a variety of audiences, so we’re thrilled to have more talented hands on board. MetaMask is still hiring for a variety of other positions – check out our open roles and get in touch! This holiday season we’re reminding ourselves to give back to those less fortunate. We’re particularly proud of Randy Brito, a member of the MetaMask support team. He and his family fled Venezuela when he was 14, and since then he’s been running an online forum called Bitcoin Venezuela. The forum teaches people how to mine bitcoin, and donations to the organization help fund soup kitchens, schools, farms, and continuous education. They’ve also partnered with GiveCrypto to identify ways crypto can help people in need. Visit Bitcoin Venezuela ⚡️ to learn more. He operates this all remotely, part time, in addition to his daily work here at MetaMask. We are very proud to have Randy on our team, and deeply hope Ethereum and other decentralized technology will improve the lives of many in need. Some of you may remember last year we encouraged donations to Merry Merkle, a collaboration across the blockchain community to raise money for a youth shelter in Toronto. This year, they’re partnering with African Angels, an organization that helps fund primary school education for poor and disadvantaged children in South Africa.